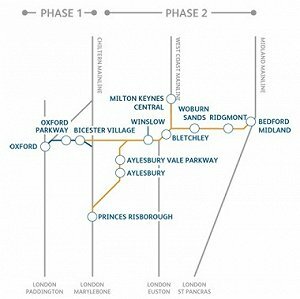 Network Rail has announced plans for the second phase of the East-West Rail scheme, a proposed upgrade of the railway linking Oxford to Bedford and Milton Keynes, and Princes Risborough to London Marylebone. It has called upon the public to voice their opinions on the proposals in person or online. Work on the scheme will involve upgrading and reconstructing underused sections of the railway which link Great Western, Chiltern, West Coast and Midland main lines north of London, providing an east-west route. A new station at Winslow has been proposed, as have two new platforms at Bletchley, the construction of 22 new footbridges and subways, 18 new overbridges and changes to 97 railway crossings. The first round of exhibitions has been set up to provide a detailed overview of the proposed scheme, in a bid to gain feedback from local residents. Phase One of the East West Rail project between Oxford and Bicester is almost complete. Network Rail route managing director, Martin Frobisher, said: “I am really pleased to have delivered phase one of East-West Rail. A new service from Oxford to Marylebone, from late October, will be a great new option for people travelling to and from the capital. “As our attention now turns to the future, we want to hear your views in order to properly understand what’s needed for the next phase of this scheme." Network Rail anticipates submitting an application to the Secretary of State for Transport in the summer of 2016 in order to obtain the necessary permissions to complete the work.